Back in the beginning of fall when the weather was good, our little group decided to take a family trip to participate in fun fall festivities. What could be more fun on a fall day than a jumping pillow, hay ride, apple cannon, and of course a trip through a corn maze (which we pretty much cheated our way through then ended up walking out the entrance instead of the exit)? And yes, things like what is happening on the left actually happen when we have a family fun day. What can I say? 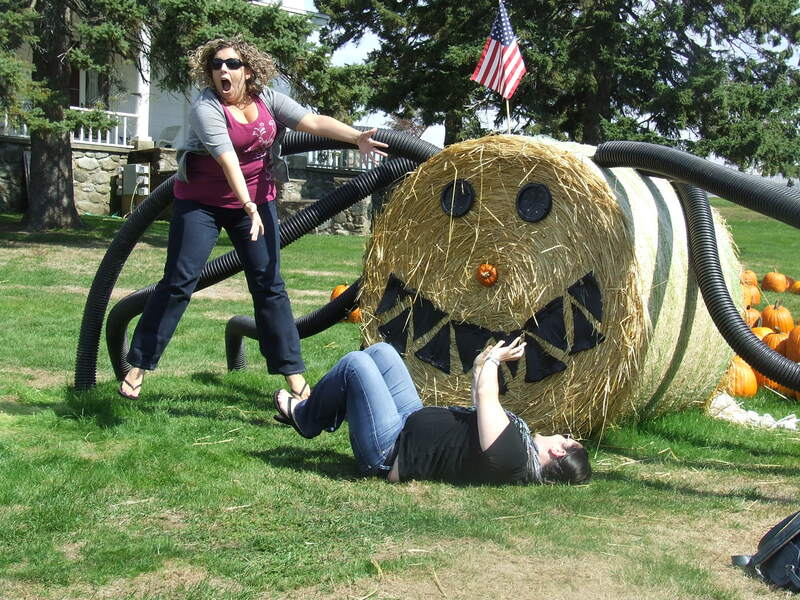 We love jumping photos, so any excuse to make a photo into a jumping photo will work, even if it’s Susical being attacked by a giant hay spider. Sadly, our first farm didn’t have any apple picking there. You’d think a place that lets you shoot apples out of a compressed air cannon would have some trees, but no so my friends. We had to make our way over to the next town to find a place to go apple picking because I of course had to make some kind of apple cupcakes. These weren’t going to just be any cupcakes, they were going to be the perfect combination of fall flavors, like a bite of apple pie a la mode all wrapped up in the perfect little cupcake package. 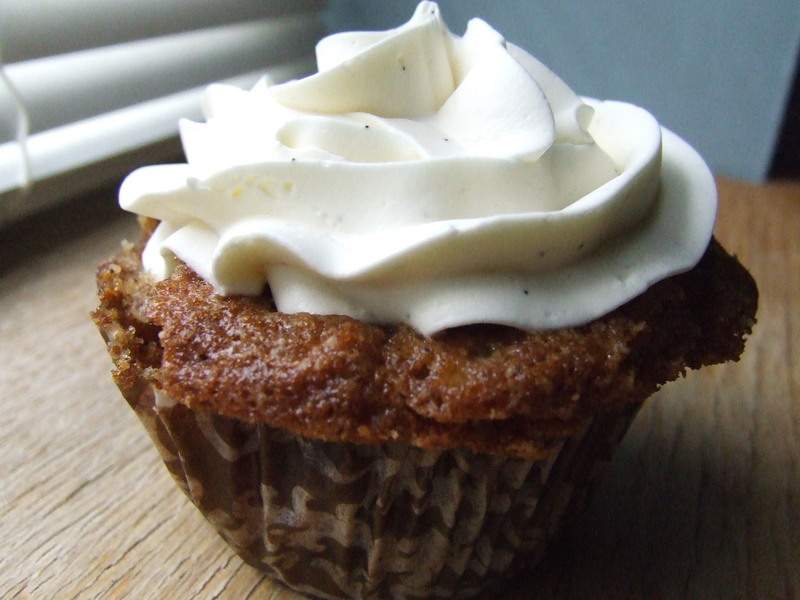 So how about caramel apple cupcakes with vanilla bean frosting? Sounded pretty good to me, so we got to work picking the perfect apples for the cupcakes (and at $15 a bag, they should be some perfect apples). These cupcakes were amazingly similar to the base of the farmer’s market zucchini cupcakes because I wanted a really good spiced cake base for them and let’s face it, I’m not creative enough to completely come up with something myself out of the blue (well okay, I’ve done it a few times but I swear it’s a lot harder than it sounds). Preheat oven to 350 and line 18 cupcake tins with liners. Melt butter in a medium-sized pan over medium heat. Once melted add 2 cups of chopped apples and brown sugar. Cook until apples are just starting to get soft (you still want them to be firm though because they will continue to cook when you bake them in the cupcakes). Take pan off heat and set aside. In a large bowl beat eggs and add in oil, vanilla and zucchini. Mix only until combined. Whisk together all dry ingredients (sugar, flour, cinnamon, pie spice, ginger, baking powder, baking soda, and salt) in a separate bowl. With the mixer on medium low add in the flour mixture in three batches making sure to completely mix everything in after each addition. Fold in apple mixture to the batter until just combined and spoon in a bit of batter into each tin (until it it just almost half way filled). Place caramel candy in the center of the tin and cover each with the remaining batter. So I know what you’re thinking, these sound pretty amazing, huh? How could they possibly even need frosting? Oh, but they do! And nothing was going to go better on these puppies than a vanilla bean buttercream frosting. 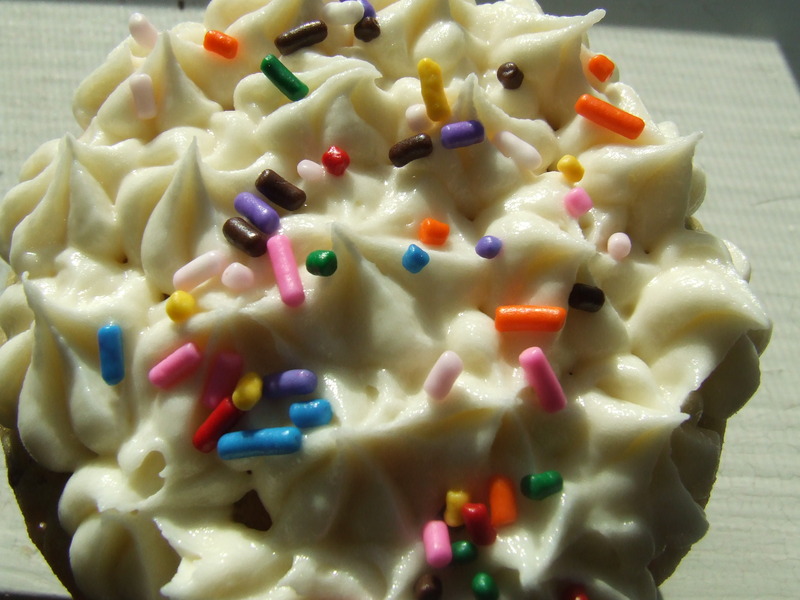 Yes, you’ve heard right…I’m breaking out the bulk bourbon vanilla beans used to make the vanilla extract for this frosting. I used the best Swiss Merengue buttercream frosting recipe that I have and scraped out the little black flecks from the inside of a few beans to add in. I even broke out the homemade vanilla extract for this one to make it extra special because if I haven’t mentioned, these were for a bachelorette party. And God was this frosting good. You know how I always mess up this recipe? I don’t know what my problem is but it’s completely a hit or miss for me, but thankfully this day it was a hit. 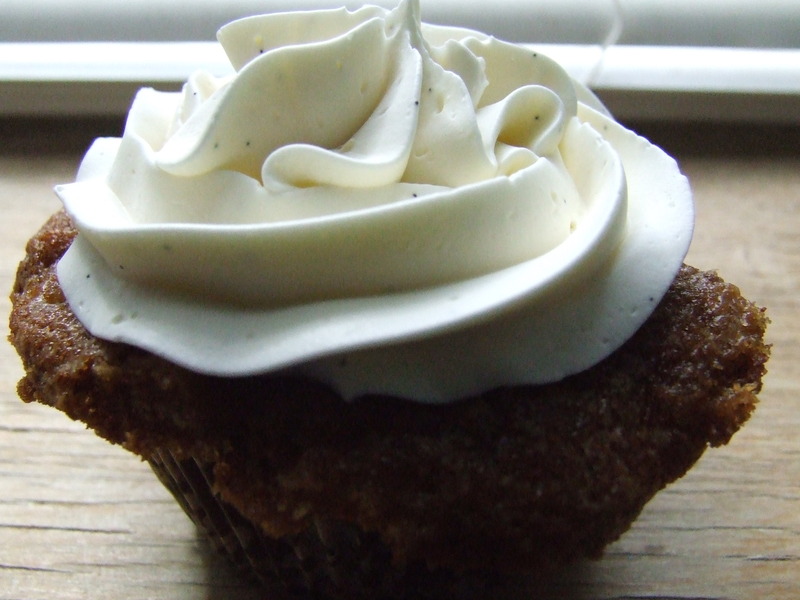 The frosting was the prefect consistency of light, buttery, vanillaness. I have to tell you a secret though. I imagine that the frosting went really well with the cupcakes but in all honesty I can’t give you my opinion on it because I never actually got a chance to eat a cupcake. I had some frosting, but never combined with any cake! I’m going to go out on a limb though and say they came out okay because no one was complaining to me about them. I think people also really liked biting into the cupcake to have a melty little caramel surprise inside. Now I’m going to have to do a redux so I can actually try them the second time around. Shhh, My Favorite Cupcakes Come from a Box! Yes it’s been another looooooong time, but well know I’m a pretty horrible cupcake blogger, so that’s that. Anyway, I probably shouldn’t admit that my favorite cupcakes come straight from a box, but I’m pretty brave so I’m just going to put it out there. 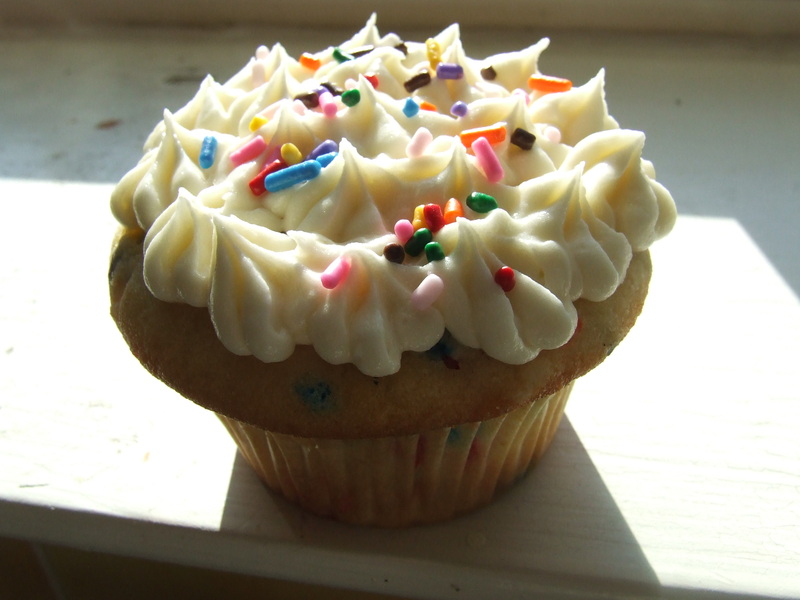 Give me a choice between any homemade cupcake and a funfetti cupcake made from boxed mix (and preferably with rainbow chip frosting), and I’ll choose the boxed cupcake any day. There’s just something enticing about the perfectness of a white cupcake specked with a rainbow of colors when you bite into it. I mean, does it really get better than that? Sooo, since two friends were celebrating their birthdays within just days of each other, I made a homemade version of my favorite cupcakes (and trust me, I know Mando likes them too). Believe it or not, there aren’t really any recipes out there for funfetti cupcakes, so I had to just go with my own here. Starting with a basic yellow/white cake recipe and adding the pretty sprinkles seemed like it would do it but I had tried this before and it wasn’t super successful. Last time around I made a huge cupcake cake with the funfetti and decided to put as many sprinkles in as I could. Yeah, bad idea. 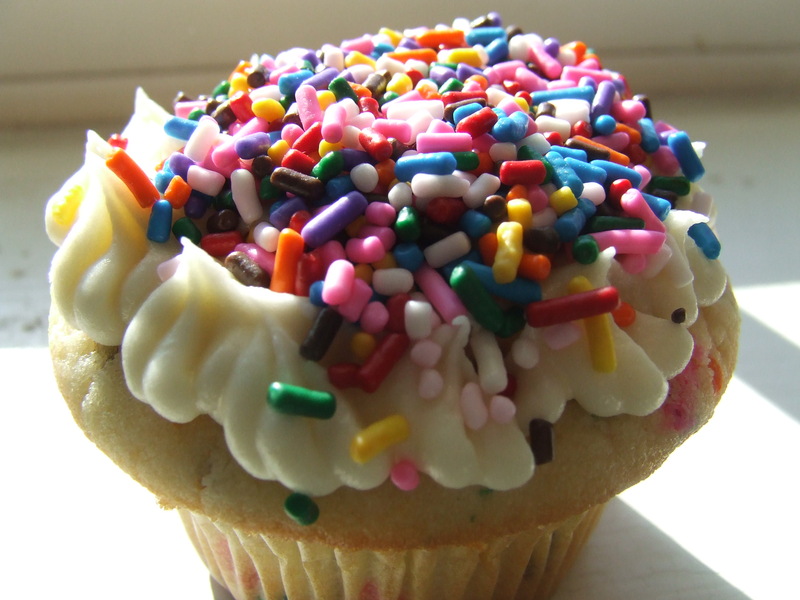 Adding a cup of sprinkles to a cupcake batter won’t ever be a good idea, so here’s your warning: Don’t try it! This time around, I went with a mere quarter of a cup and it turned out much better. Alternate adding in the milk and dry ingredient mixture until fully incorporated (don’t over mix) and mix in vanilla. Blend together butter, sugar, and vanilla until mixture is smooth. Slowly add in the milk one tablespoon at a time (adding more milk if you need a thinner consistency). This was Susical’s doing, she clearly loves her sprinkles! I guess they were a success afterall.